In the 4th Dynasty, from the ancient Egyptian monarch, Khnum Khufu, known by the Greeks as Cheops was an emperor of Egypt as the second pharaoh of the 4th Dynasty. He ruled Egypt in 2589–2566 B.C. for about 63 years according to Manetho or 23-46 years according to modern historians. Khufu was born around 26th century BC, the specific date of his birth is unknown. He died in 2566 B.C. He was the son of the founder of pharaoh of the 4th Dynasty in the old Egypt: Pharaoh Sneferu and his beloved royal wife Queen Hetepheres. Khufu had nine sons and five daughters from two of his wives, the first wife as Meritites I and his second wife as Henutsen. It is known that Khufu became the Pharaoh in his twenties. Pharaoh Khufu was able to succeed his father Sneferu as the second king of the 4th Dynasty and is also known the one who commissioned the great pyramid of Giza, which is one of the Seven Wonders of the Ancient World. It took about 20 years for this pyramid to build. It is 480 feet tall, 31 of which have eroded since the time of the pharaoh. It was considered the tallest man-made structure in the entire world for about 4,000 years. According to research, Khufu was known as one of the greatest kings. His history, however, is poorly documented. Khufu full name as Khnum Khufu means “Khnum Protects Me”. King Khufu succeeded his father and became the second king of Egypt in the 4th Dynasty. He has ruled Egypt for about 4600 years ago. The Great Pyramid of Giza was created under his rule. It took about 2.3 million blocks weighing an average of 2.5 tons each to build this pyramid. 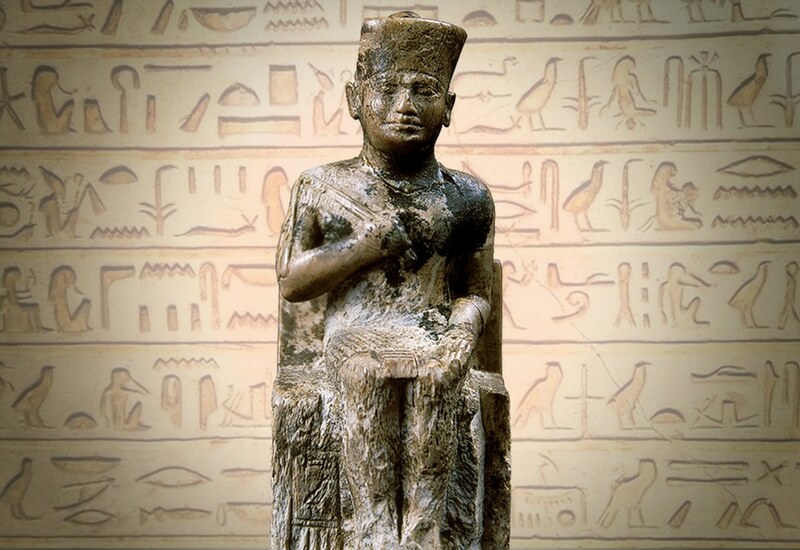 King Khufu’s Chief Chancellor was his nephew Hemiunu. He was known to be the second most powerful man that existed in ancient Egypt during Khufu’s reign. He was also a member of the royal family. He is famously known for being the architect of the Great Pyramid of Giza. King Khufu wanted to create the “Pyramid of Giza” along with stairs because he thought that the stairs on this pyramid will take him to heaven. He also made a door within this pyramid whose position was right at a place where the moon exists so whenever night comes, light could enter on his grave, and that is of course the moon light. Khufu built that template for another reason as well. He wanted his next generation to know how much powerful he was by looking at his pyramid. It is said by the Greek Historian Herodotus that Khufu was a horrible and a wicked ruler. He says that Khufu used to force people into slavery to build his pyramid. However modern Egyptologists completely disagree with the statement made by Herodotus. They argued that Herodotus lived around 2000 years after the reign of Khufu and therefore Herodotus sources were antiquated. They also mentioned that he didn’t force people to work as slaves but hired them instead. Khufu’s reason of death is still not recorded. His mummy was never found, and it is known that Khufu was not just buried as a body in the pyramid, but also with a lot of jewels and riches however, robbers stole all the treasures and even damaged the Pyramid of Giza. Upon Khufu’s death, his son named Djedefra was appointed to become Pharaoh. It is however unknown and not cleared that for how long he ruled Egypt. After the death of Djedefra, Egypt was ruled by another one of Khufu’s sons named Khafre. Khafre in his king’s era also built a huge pyramid at Giza, but it was a bit smaller than his father’s pyramid. According to the historians, King Khufu has only one statue that is left and it is known with the name “Khufu Statuette” and can be seen at the Egyptian Museum in Cairo. Khufu Ship was built to be used by the Pharaoh in his afterlife. This ship is about 143 feet (43.6 m) and breadth of 19.5 feet (5.9m) and is ranked as number one in the Egypt great discoveries. One of the biggest Khufu accomplishments is the “Great Pyramid of Giza” that is among the Seven Wonders of the World. Its design is so complex that people believe that it is not created by Khufu rather aliens came on earth and created it. A pyramid is very hard to be built and Khufu is also considered to be one of the brilliant minded people who came up with such a complex design of the pyramid. It is said that Khufu started working immediately on the pyramid as soon as he was given the throne. Khufu’s another big achievement is that he succeeded his father and became a second king of the fourth Dynasty of Egypt. Since there is a poor documentation regarding King Khufu, therefore it a theory that he had also established positive diplomatic relations with neighboring kingdoms, such as Byblos. Also, Khufu worked hard at improving maritime trade by expanding the ports in north side of Egypt. The Pyramid of Giza is believed to be created as a tomb for King Khufu. He ordered his workers to build a special door for him inside the pyramid from where the moon light comes and lights directly upon his grave. The tomb was built as complete in about 2560 B.C. King Khufu after given the throne immediately started working on the pyramid of Giza as he knew that it will take a lot of time for this pyramid to be completed. These pyramid hypotheses are in a way that large stones are to be shifted from one place to another in order to fix them into the position where it could be given a complete shape of the pyramid. This work was done by the workers of the pyramid. The material that is used to create this tomb is Limestone, granite. It is sad to be noted that some part of the pyramid has been destroyed by robbers. In 1954, a ship was discovered by Kamal-el-Mallakh into the pit carved in Giza bedrock. It is known to be the ancient masterpiece wood craft that could still sail in the water. It is an intact full-size vessel form the ancient Egypt that was in the pit of the Giza complex and at the foot of the great Giza pyramid. It has been later shifted to Giza solar boat museum. Khufu ship when was discovered, had no bodies found inside, this is because this ship was made to be used by the Pharaoh in the afterlife of King Khufu. 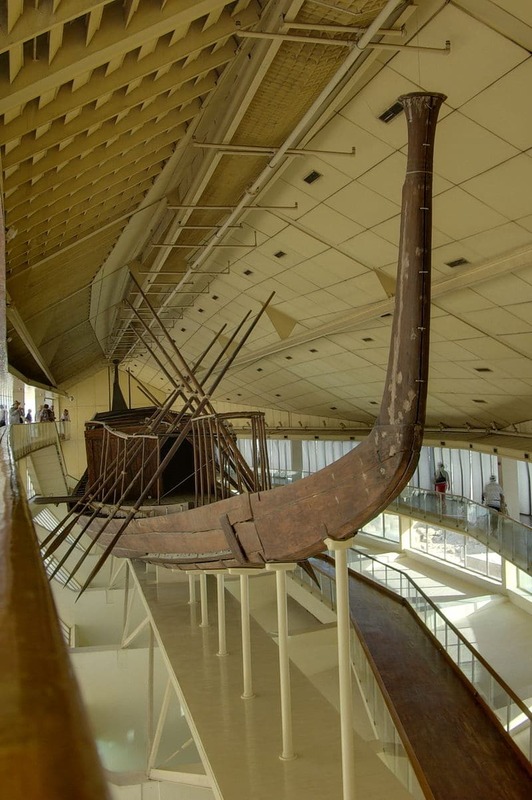 Khufu ship is about 143 feet (43.6 m) and breadth of 19.5 feet (5.9m) and is ranked as number one in the Egypt great discoveries. It took so many years for this ship to be reconstructed by Haj Ahmed Youssef as for this, it was very important for understanding the design, the architecture of the boat in order to avoid any kind for damage. The Khufu Statuette known as the “Ivory figurine of Khufu” is an ancient statue of King Khufu and is the only statue that is left that describes his existence; this statue was found in 1903 by Sir William Matthew Flinders Patrie during excavation of Kom-el-Sultan in Abydos, Egypt. The size of Khufu statue is 7.5 cm high, 2.9 cm long and 2.6 cm deep. It is not clear when this statue was created but the historians say that either it was built in the 4th dynasty or the 26th dynasty of Egypt and was discovered in the temple of khentyamentiu Abydos, the Upper Egypt. This statue can be seen at the Egyptian Museum in Cairo. According to the overall look of this statuette, this statuette is damaged. The king in this statue is sit on a throne that is not decorated and with a low back. It has placed its right hand on its breast and within his right hand; he is holding a flail, symbol of his royal power. His left arm is bending with his lower arm resting on his left thigh. His left hand is open, and palm is resting on the knee and his two feet are broken and his crown is also a bit broken. He does not have a Pharaonic ceremonial beard like normally the rest of the kings of Egypt had. What is really known about Egyptian queen Nefertiti? Interesting articleI think there was much of information so i think this would be a great way of teaching someone something new if they hadn’t already learned it.